March 2015 61 Top & Middle Right Salmon fishing and trading were central to the life of the Spokane and Nez Perce Native Americans along the Spokane River. The plaza celebrates that connection, creating an upper and lower falls for the plaza to represent the downtown falls. 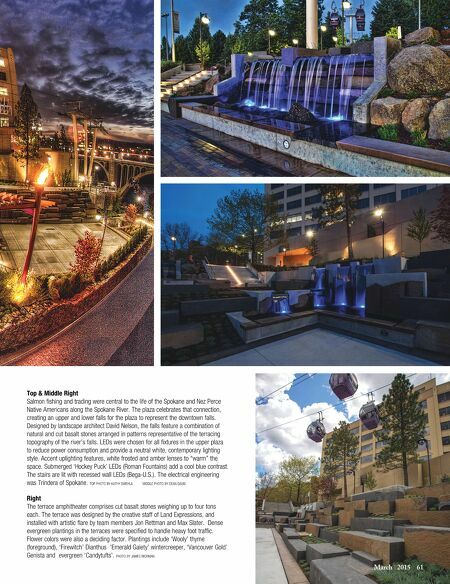 Designed by landscape architect David Nelson, the falls feature a combination of natural and cut basalt stones arranged in patterns representative of the terracing topography of the river's falls. 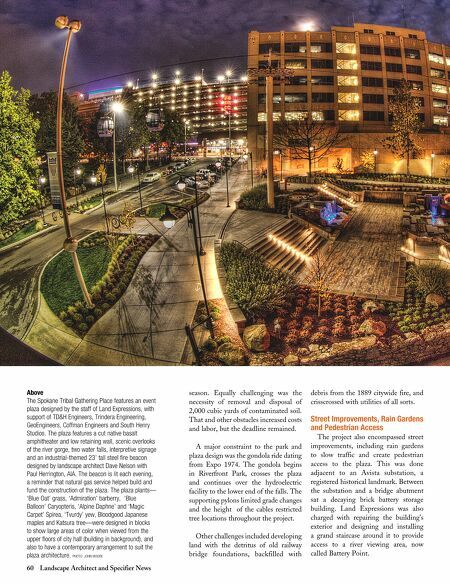 LEDs were chosen for all fixtures in the upper plaza to reduce power consumption and provide a neutral white, contemporary lighting style. Accent uplighting features, white frosted and amber lenses to "warm" the space. Submerged 'h ockey Puck' LEDs (Roman Fountains) add a cool blue contrast. The stairs are lit with recessed wall LEDs (bega-U.S.). The electrical engineering was Trindera of Spokane. ToP PhoTo by KAThy SWEhLA MiDDLE PhoTo by DEAN DAviS Right The terrace amphitheater comprises cut basalt stones weighing up to four tons each. The terrace was designed by the creative staff of Land Expressions, and installed with artistic flare by team members Jon Rettman and Max Slater. Dense evergreen plantings in the terraces were specified to handle heavy foot traffic. Flower colors were also a deciding factor. Plantings include 'Wooly' thyme (foreground), 'Firewitch' Dianthus 'Emerald Gaiety' wintercreeper, 'vancouver Gold' Genista and evergreen 'Candytufts'. PhoTo by JAMES RiChMAN.